romantic gestures: my work mates were forgiven for assuming monday's delivery of a sample of valentine's day treats from lindt were sent from a secret boyfriend, when actually they were just there to remind me that my favourite day - galentine's day, is just around the corner. i'll be the lone single lady in my group of friends (in london), so i'm planning a lady date for me, myself and i - i'll bring the chocolates. longer days: i was pleasantly surprised to find that - despite waking to a frozen land on tuesday, the sun seemed to hang around later than usual. it even painted the sky all kinds of amazing colours as we finished off our work day, which was a nice touch for the-day-after-blue-monday. dontchathink? panic stations: i have been listening to the new panic! at the disco album on repeat since it dropped last week. i was a massive panic fan back in the olden days, when i was youthful and a partial emo, and i thought brendon urie's voice was probably the most amazing thing i'd ever heard, but then pretty.odd never lived up to a fever you can't sweat out and i moved on. just like that. but then we saw him at reading and he played a sample of new stuff and it was amazing. it was the panic i loved and remembered, and i have been reminiscing hard. holiday planning: on wednesday i found an amazing deal on travelzoo for four nights in italy for two for £159 each! return flights from london, with two nights in rome and two in venice and in four star hotels, no less, plus train travel between the two, for less than two hundred quid! an absolute steal. i was considering going alone, but then charley put her hand up to be my travel buddy, and now we're set for a mid-march adventure to the med - i can't wait! mid-week mayhem: i haven't seen carmen since before she headed off to australia last november, despite the fact she's back in the motherland (with one australian boyfriend in tow!) since christmas, so on wednesday we decided happy hour cocktails would solve that, and so they did. and they also did the following night when my bangarang babes and i hit musical bingo for their "around the world with luisa omielan" event - even though luisa wasn't actually there because she was sick. there was the usual dancing on seats, dancing on tables, dancing on the stage, as well as a silent protest for t'pau, and some epic lip-syncing to 'let it go' because - as it turns out - not a lot of people know the actual words. see you at the next one? stationery stash: omg kate spade stationery. i literally cannot. 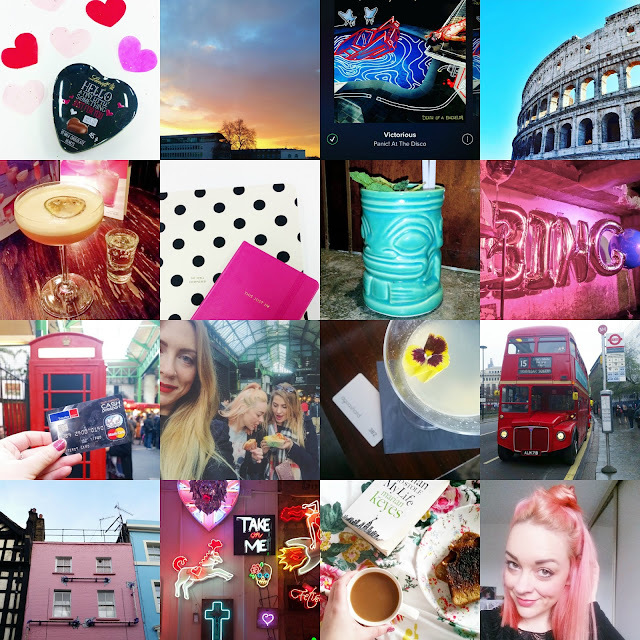 tourist adventures: on saturday i gathered some of my fellow antipodean favourites and we embarked on a london-tourist adventure to end all adventures. you might have seen it unfold on instagram (lucky you), but the full story will be revealed here tomorrow... come back and read! lazy days and hair restoration: i so deserved a lay in on sunday, and with my flatmate out having a life of her own, i went into full self-pampering mode and finally sorted out my barnett. i had a few new products to try out in hopes for creating the right shade of pink and losing the many shades of yellow, and by gum i think we did it! full review to come on what i used later in the week, so if you're interested in how i maintain my colour, have a read. until then, have a fab week!